Approx 310 X 310. 28 pages. Glossy card cover. Full colour inside. Group biog. Colour and tinted colour photos. 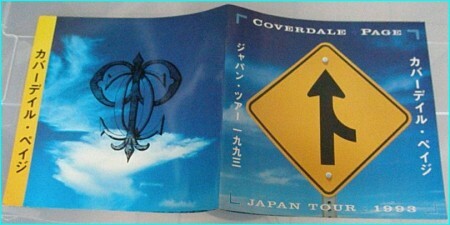 COVERDALE PAGE Japan Tour 1993 (Superb Japanese only 12″ x 12″ full colour tour programme featuring biography and some great photographs – they only toured in Japan so this is a rare and unique item for any collection. Beautiful MINT condition too!). Coverdale•Page was a musical collaboration featuring Whitesnake and former Deep Purple lead vocalist David Coverdale, and former Led Zeppelin guitarist Jimmy Page. The project between the two artists commenced in 1991 at the suggestion of American A&R executive John Kalodner. An American arena tour was planned for the summer of 1993, but after sluggish ticket sales the tour was scrapped in favour of a series of concerts in Japan, after which the partnership was dissolved. Page subsequently teamed up with Plant for an “UnLedded” MTV project and Coverdale returned to Whitesnake. As the 1980s turned into the 1990s, Jimmy Page didn’t know quite what to do with himself. In the 10 years since John Bonham’s death instantly ended Led Zeppelin, he cut two albums with his supergroup the Firm, created the soundtrack for Death Wish II, and released 1988’s Outrider, which remains his lone solo album. But the enormous shadow of Led Zeppelin hung over everything he did, making them seem tiny by comparison. David Coverdale, Page’s Geffen label-mate, was in a similar place in his career. He’d just made the decision to end Whitesnake, but had no real future plans. Geffen A&R executive John Kalodner, who had just masterminded Aerosmith’s stunning comeback, saw an opportunity to create a new super-group. It made perfect sense. Page needed a singer and Coverdale, whose vocal style had been compared to Robert Plant for years, needed a guitarist. They called the project Coverdale/Page, quickly writing 11 new songs together they released on their debut album in March of 1993. They’ve been largely forgotten these days, but singles “Pride and Joy,” “Shake My Tree” and “Take Me For a Little While” actually got some radio play and climbed near the top of the Mainstreams Rock Tracks chart. The album debuted at Number Five on the Billboard album chart. There was talk of a world tour. Two months after Coverdale/Page’s LP hit shelves, Robert Plant released his solo album Fate of Nations. Critics were not impressed, and it peaked at Number 34, by far the worst showing of his solo career. He wound up opening up for Lenny Kravitz on the road. He was unable to mask his disdain for Coverdale/Page when speaking to the media, labeling the project “David Cover-version.” It was right around this time he phoned up Page and began talking about the possibility of some sort of reunion. This immediately put the kibosh on the giant Coverdale/Page tour, and they wound up playing nothing more than a tiny run of shows in Japan that December. Here’s video of them playing “Black Dog” in Osaka. Some conspiratorial-minded Led Zeppelin fans think the entire Coverdale/Page project was an elaborate attempt to troll Robert Plant and shame him into a reunion. That certainly wasn’t Page’s plan from the beginning, and he could never had anticipated Fate of Nations would tank, but it definitely paved the way for the Page and Plant tours of the 1990’s. Coverdale, meanwhile, went back to Whitesnake the following year and remains there to this day, leaving Coverdale/Page as a tiny footnote on his long career. Coverdale/Page – Take Me For A Little While.